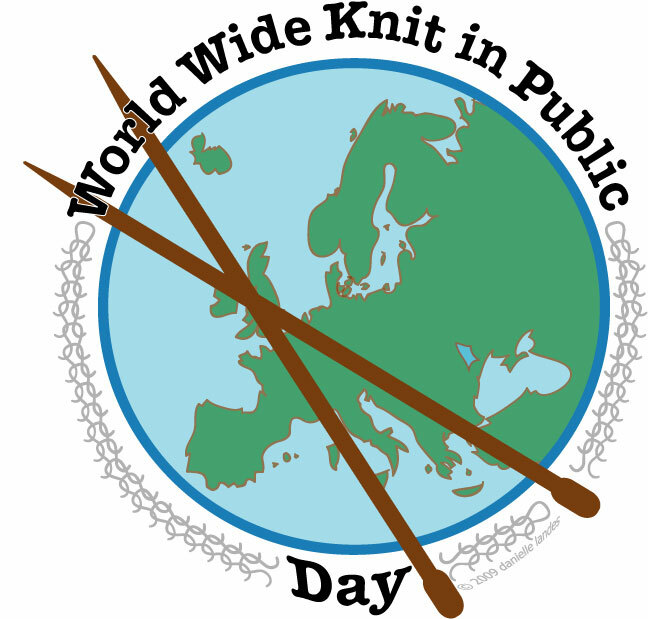 Go to the Worldwide Knit In Public Day website to find the nearest event, or if you want to host your own, you’ll find info there, as well as a database that you can add your event to. I thought the key to high sales in the retail or restaurant business was to bring new buyers into the store and keep the old ones coming back. Yet when we went to restaurants, coffee shops and grocery stores in our area to say, “There are 12 to 20 of us and we want to hang out in your place of business for two or three hours,” we were told “No” or received no response. I didn’t get it. A columnist for our local paper published an article informing the public about our search for a site for Knit in Public Day. We received only two invitations from the entire readership. I was totally confused by the lack of response. Why weren’t they fighting for our business? We are the buyers! We decide where we will buy groceries or clothes and school supplies for our children. We decide where to take our families when we eat out. In addition to the loss of whatever money we might have spent that day, is the loss of good will and future sales. Then, suddenly, it came to me! We are not seen as the buyers. Today the public perception of knitting and knitters is negative. Many people think that knitting is only for old ladies who have nothing else to do. Many men refuse even to try because of this image. It does take some effort to learn something new, and time to develop it into an art, but some men are self confident enough to have made the effort. People of both sexes and all age groups take knitting seriously. That may be a fact, but businesses in our area are ignorant of that fact, and will continue that way unless knitters make some effort to change the public perception of who knitters are, and what it is all about. We desperately need Knit in Public Day. In fact, it is important to make every day Knit in Public Day. New knitting groups are organizing all the time, but most are still somewhat behind closed doors. They are held in homes, yarn shops, community rooms of a church or library. We need to get into the restaurants and coffee shops where there is more exposure to non-knitters. Whatever posters and fliers we distribute should be going into the entire community; not just in the knitting community. We should be looking for the opportunity in everything we do to get positive press for knitters and knitting.